Schoolhouse Crew Reviewers were offered a variety of options from Brookdale House, and with my son we reviewed The Grammar Workbook Set which was revised by Kimberly Garcia from two older grammar books. This was accessed as a digital download. My son downloaded the student workbook on his computer, and I was able to download both the student workbook and grammar workbook answer key printable/digital set on my laptop. Once downloaded, an internet connection was no longer required to access the lessons. This set is also available in physical workbook format. Somehow, lessons on the computer have more appeal to my 6th grader. Brookdale House's 220 page student workbook can be printed or read from the computer screen (our option was screen of course.) My son wrote his answers on paper instead of printing the ruled pages and writing directly on the lessons. An optional schedule is suggested which suggests taking three days a week for this workbook, however some of the longer lessons can be stretched over several days. He was able to complete these lessons independently. Topics covered in these middle school grammar lessons include parts of speech, verb tenses, verbals, phrases and clauses, punctuation, sentence writing, paragraph writing, and style imitation. We chose to skip the optional sentence diagraming so didn't require the optional diagraming book. Lessons began with grammar rules which were then practiced in related activities. Sentence content was appropriate for him, for instance some topics included astronauts, video games, or animals. This isn't a colorful wookbook with cartoon images, rather succinct black and white lessons. Frequently word charts are included. My mom is clearly concerned with my son's spelling skills. I think they are pretty typical for an eleven year old boy, but because of her concerns I was happy to see that though spelling wasn't specifically listed as a feature in these lessons, vocabulary was built in so spelling was easily integrated. Initially, his lessons were able to be completed quickly, which my son did enjoy. Portions of the lessons called imitating style did take a little longer to complete. Writing from dictation is used as a tool for focusing on proper punctuation. Exercises build on the previous lessons. Moral lessons are built into the grammar lessons as evidenced by this short sentence "Honor your father." which is used in the lesson about imperative sentences. History was also built into the lessons such as speeches by Patrick Henry and President Abraham Lincoln used for imitating style lessons. The 111 page Grammar Workbook answer key provides complete answers broken down into corresponding lessons. Although I had the answer key on my computer, it was not necessary to reference it very often. Our thoughts-- Even though it was on his computer, it was still a book and didn't have the fun factor of interactive games that my son enjoys. The lessons were progressive, so completing them in order had a natural flow. The material covered is relevant and necessary. 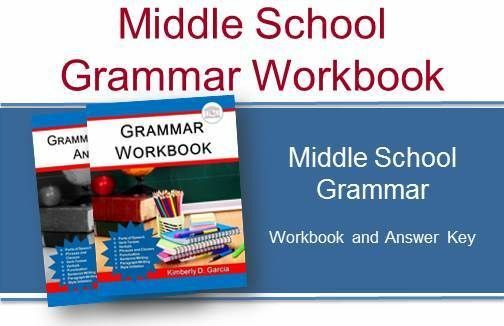 Sixth grade grammar is mandatory, and this Grammar Workbook Set does cover the essentials. Click the banner below to read other Schoolhouse Crew reviews. Click here to access sample pages. If you sign up for their newsletter, there are occasional freebies included for you to download. So was it a good fit? would you easily recommend it for others to use? What did you like most about it? My son was able to use it independently.i liked the content included in the lessons like the speeches I mentioned.